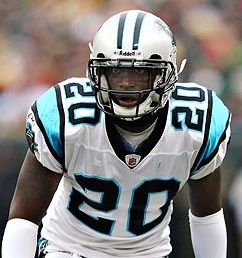 Gamble played both cornerback and wide receiver in college, and was part of Ohio State’s 2002 national championship team. He was chosen by the Panthers in the first round of the 2004 NFL draft (28th overall) and, despite being a raw talent, moved directly into the starting lineup. Panthers went 7-9 to finish third in the NFC South while leading the NFL in interceptions (26). Gamble followed up in 2005 by intercepting 7 passes that he returned for 157 yards and a TD. Fast and agile, he could also be inconsistent and reckless in taking chances. Gamble’s play improved over time, as a tackler in the defensive backfield as well as a cover corner, and he was typically a solid starter, if not an elite performer. He also encountered problems with injuries but lasted for nine years with Carolina and appeared in a total of 123 games. While Gamble endured a difficult season in 2010 in which he was benched for a time and suffered a hamstring injury, costing him five games, he bounced back in 2011. He was released following an injury-plagued 2012 season and retired at age 29, having intercepted a franchise-record 27 passes, two of which he returned for touchdowns.